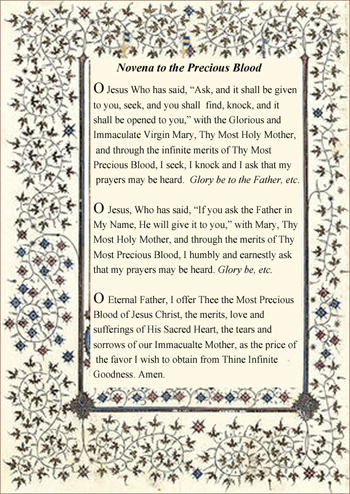 The month of July is dedicated to the infinitely important devotion to the Precious Blood of Our Lord Jesus Christ. This devotion is as old as our Holy Faith. Historically, it was alluded to after the fall of Adam and Eve when God clothed our first parents in the skin of an animal whose blood had been shed. (Gen 3) In the Old Testament, the sacrifice acceptable to God was the blood of animals shed in His honor, as can be seen in Abel’s holocaust offering of a prized lamb. Such offerings were a prelude of the promised Messiah who would redeem mankind from Original Sin by the shedding of His Precious Blood. Foreshadowings of that sacrifice are found in Cain’s shedding of the innocent blood of his brother Abel, by the blood of the Paschal Lamb sprinkled on the doorposts of the Israelites the night before the Exodus from Egypt and by the sacrifices of Isaac and Melchizedek. Then, at the last Supper ur Lord gave us the immeasurable gift of His Body, Blood, Soul and Divinity in the first Holy Sacrifice of the Mass. The Precious Blood of Our Lord is daily offered in the consecrated wine and bread in the Holy Mass and is continually venerated by the faithful in Holy Communion and Adoration of the Blessed Sacrament. This tremendous gift from God that won our salvation and entreats for us before the throne of God is seemingly little understood and appreciated. How many sermons have you heard on the Precious Blood or the multitude of Eucharistic miracles, such as the phenomenal Miracle of Lanciano in 700 when the unleavened bread became the cardiac flesh of the Sacred Heart and the Precious Blood flowed from this Sacred Flesh? Let us look briefly at the heart-rending instances of Christ’s shedding of His Precious Blood during His life. Again, it is worth noting that this agony is rarely mentioned in sermons today. Would the progressivists or even some conservatives even believe this? Our Lord was abducted in the Garden by Roman soldiers, and the terrible moral and physical torture began, executed either by the apostate Sanhedrin and its cohorts or by the Roman soldiers and employees of Pilate. To survive it, Our Lord used His Sacred Divinity to enable Him to suffer beyond human capacity. No human could have survived the merciless beatings he suffered during his transports from Annas to Caiaphas, to Herod, to Caiaphas, and finally to Pilate. One of the cruelest tortures inflicted on Our Divine Savior was the Scourging at the Pillar. Anne Catherine Emmerich describes the scene: The base wavering Pilate, after finding no guilt in Christ, ordered the scourging with the aim of raising the pity of the Jews and let Him go. Thereupon, the cruel executioners lashed the Innocent Lamb with three kinds of scourges, each more vicious than the last. Roman Law prescribed 50 blows, but Our Lord received thousands of blows. (This is confirmed by reports of Ven. Mary of Agreda and St. Bridget). Not yet satisfied with the lacerated frame of Our Savior, bathed in His Precious Blood and quivering with pain, the Sanhedrin then pounded into the Head of Christ a crown made with hawthorns, the hardest of all woods. 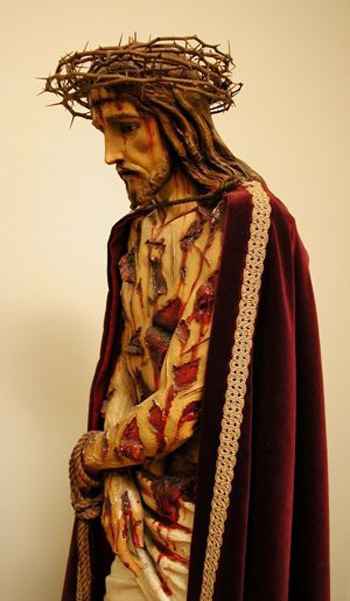 These thorns pierced His Sacred Head in wounds as deep as one inch according to scientific studies of the Shroud of Turin. On the Cross Our Lord continued His agony, shedding His Precious Blood to the last drop. His hands and feet (one foot over the other) were brutally nailed to the cross with large spikes. According to data from the Shroud of Turin and Ven. Mary of Agreda in her Mystical City of God, His Sacred Hands were nailed through the palms, and large ropes were tightly bound about his wrists to help hold His Sacred Body to the Cross. Imagine the shock suffered by the Precious Body of Our Lord, who weighed 170 pounds, tied to the 250 pound cross, being dropped in the 16-inch deep rock hole on Golgotha. We think too little of the sufferings of the Body and Spirit of Christ. We should contemplate often Our Lord, agonizing on the Cross for three hours, His moral and physical strength, entirely exhausted. Finally, He bows His head, saying “All is consummated.” “Father, into Thy hands I commend My spirit.” Thus, after shedding every drop of His Precious Blood for mankind, for us, the Savior of the World expired. 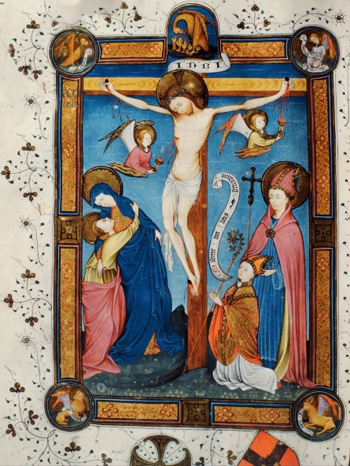 A suggested reading, with moving descriptions of The Passion of Our Lord, is Devotion to the Precious Blood, reprinted from a 1926 book published by the Benedictine Convent of Perpetual Adoration. A highly recommended devotion to commemorate the sufferings of Christ is to pray daily The Fifteen St. Bridget Prayers, dictated to the Saint by Our Lord in the 14th century. O Jesus! True and fruitful Vine! Remember the abundant outpouring of Blood which Thou didst so generously shed, pressed down and running over as the grape crushed in the wine press. From Thy Side pierced with a lance by a soldier, blood and water issued forth until there was not left in Thy Body a single drop; finally, like a bundle of myrrh lifted to the top of the Cross, Thy delicate flesh was destroyed, the very Substance of Thy Body withered, and the Marrow of Thy Bones dried up. Through this bitter Passion and through the outpouring of Thy Precious Blood, I beg of Thee, O Sweet Jesus, to pierce my heart, so that my tears of penitence and love may be my bread each day and night. May I be converted entirely to Thee; may my heart be Thy perpetual resting place; may my conversation be pleasing to Thee; and may the end of my life be so praiseworthy that I may merit Heaven and there, with Thy Angels and Saints, praise Thee forever, Amen.